Ambassador Hotel Lahore is 3 star hotel in central Lahore. It offers all amenities of 3 star standard. 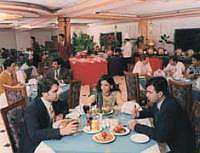 The hotel is situated on Davis road close to Mall road and all the shopping and business areas of Lahore. 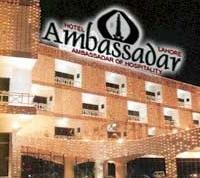 Ambassador hotel Lahore is situated in the central Lahore. It is suitable for business as well as pleasure travellers. The hotel has 53 Standard rooms and 23 Deluxe rooms. All basic amenities like TV hot & cold water central air-conditioning are available in each room. Hotel has a business center and a large restaurant. All Government Taxes, Welcome Drink on Arrival, Airport pickup & Drop Services, Buffet Breakfast, Shoe ShineUse of Swimming pool and Gym. Cancellation Terms and conditions:- Rooms Must be canceled 48 Hors before the arrival. Hotel Ambassador in Lahore, offers above rates only to Hunza tours. The online reservation payment must be made to Hunza tours not the hotel. Book your events, Meetings, Conferences Marriage parties at Hotel Ambassador or any other hotel in Lahore please feel free to email us we will offer you the best possible rates and perfect arrangements to suit your events. The above rates Include all taxes our service charges breakfast and airport pickup. The rates are special Discounted rates available thrugh Travel & Culture Services only. Terms & Conditions as advised by the Hotel. The Check in & Check out time is 12 Noon Can be extended upon request. Rooms are held till 6PM unless advised or advance payment received. Special Rates may apply for conferences and special events. Rates may be revised without prior notice.